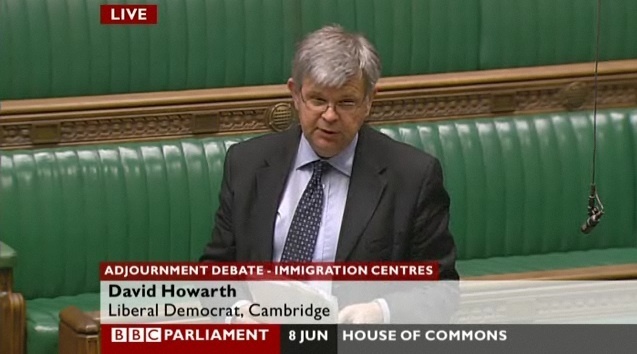 At around 22:30 on Monday the 8th of June there was an adjournment “debate” in the House of Commons on the subject of the Oakington Immigration Removal centre. 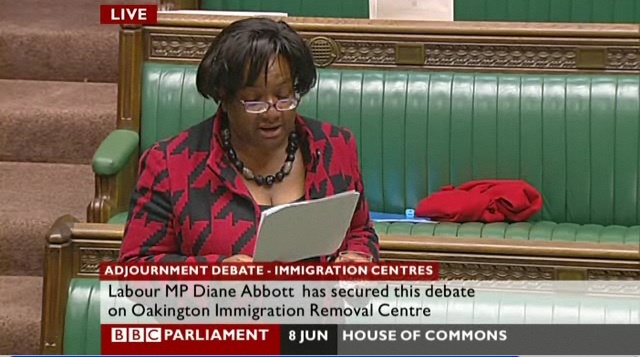 MP Diane Abbott used her valuable opportunity to decide the topic for the debate to discuss the centre. In response to Diane Abbott’s speech Home Office minister Phil Woolas stated that the centre would close within two years. When the centre was opened the government said that it would typically house people detained for a short amount of time and vulnerable people would not be detained. Diane Abbott said the impression given by reports was that people are being kept in detention or longer and longer and vulnerable people are being detained. She noted large numbers of people are now being detained for over a year despite the original intention being people would only be held for around ten days. Diane Abbott, who has recently visited Oakington, expressed concern about the attitude of those at the centre to the damming 2008 report by the Chief Inspector of Prisons, she said: “not even Penny Lambert, who is supposed to be chair of the IMB, was prepared to admit something had gone wrong at management level”. She said the centre’s management had effectively rejected the report’s findings, and had responded defensively coming up with excuses and questioning the inspector’s methodology. According to Diane Abbot the centre manager, Mr Hodgkins, in effect said he didn’t accept the inspector’s report. Diane Abbott said the IMB chair: “could ask a few more questions about the way Oakington is run” [If she thinks the chair lacks the required inquisitive nature she should meet some of the others!]. David Howarth contributed to the debate to express his concern that the times at which legal advice is available to detainees has been reduced. Diane Abbott said that if the Home Office insists on detaining people for administrative reasons that detention should not be punative. She said that she had concluded, on the basis of what she has heard, that the centre is not providing a service where detainees are held humanely, and that the regime is a punitive one, over and above the deprivation of liberty itself. When the minister, Mr Woolas, refereed to the UK border agency monitor, Diane Abbott intervened to say she had met this person, the contract manager and said :” It appears she is in collusion with the staff and takes a “hear no evil, see no evil, speak no evil” approach to her role. Given this individual is supposed to be the “Home Office’s monitor”, ensuring the private company which runs the centre is fulfilling its contract this is highly concerning. Diane Abbott said: “Immigration and asylum is a contentious subject, and there are no votes in it but nonetheless it is a test of our democracy that this house is prepared to take these issues seriously and afford immigrants and asylum seekers, and even failed asylum seekers humane treatment and due process”. 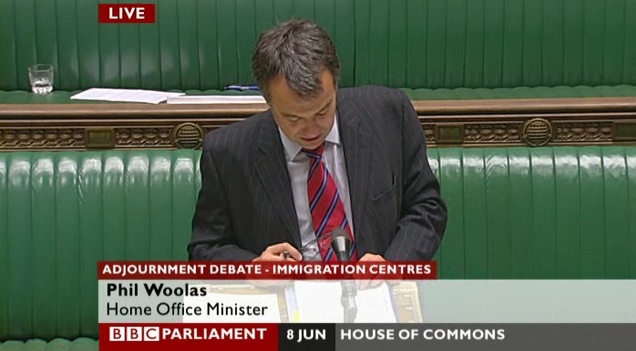 Home Office minister Phil Woolas responding also agreed that there was “no electoral advantage” in raising questions about the treatment of detainees, and said that as Diane Abbott was “doing the right thing” by raising her questions he would take her points particularly seriously and would weigh her opinions against the advice he had. I don’t think either of them are right on this point, I think people do want to vote for representatives with morals and integrity who use their positions to “do the right thing”. It would be a terrible indictment on our society if we didn’t vote for our leaders on that basis. I think that many people are concerned about the conditions in which we detain people, and want those who are held to be held humanely. I have visited Oakington and volunteered to become a member of the Independent Monitoring Board (IMB), I was rejected, in part I believe because of my view that one of the main ways in which we are treating those detained badly is through the length of time we are detaining them as a result of the slow speed of due process to make decisions about their fate. One of the things which I called for during the application process and interview was for the IMB to play a role in informing the debate about the how we treat detainees and lobbying for improvements. This was rejected by those who interviewed me, but has now happened in this debate which was informed by an IMB report and the IMB chair. During my contact with the IMB I also called for vacancies on the board to be openly advertised, this has also now taken place. However a flawed system recruitment has resulted in the board still having only half the numbers of members it ought to. I wrote to my local MP, David Howarth in advance of the debate, I had also expressed concern about the operation of the IMB at Oakington. During her speech Diane Abbott drew attention to the fact that the IMB had only six active members. She said the board was dong a good job, but was understaffed and there had been concern from local residents that it was not doing enough to disseminate information about what is going on in the centre. Diane Abbott noted that the previously the Refugee Council had a contract to provide welfare support. This was terminated in September 2008 and now welfare support for detainees rests with volunteers and the chaplaincy. She condemned the poor state of the visitors room, saying it was unsuitable and described the general facilities as clean, but worn and scruffy – something which she said flowed from the imminent closure of the centre. She said “medical justice” had been concerned by a reduction in referrals from the centre raising concerns about if detainees are able to get help. She said the facilities where those on suicide watch / close care observation wing were taken were inappropriate, looking like a cell, a place where you put prisoners in isolation. She said it didn’t feel like a therapeutic place, but a place where someone is sent for punishment. Diane Abbott said the chair of the Independent Monitoring Board : “could ask a few more questions about the way Oakington is run” but even she had said the close care and observation spaces were a problem. Immigration Advisory Service (IAS) … They are funded by the Legal Services Commission and the contract is currently being re-negotiated. There is concern that the availability of the service will be reduced to 5 days per week, from 0900 to 1700hrs. Also, the contract may be split between 2 legal service providers, IAS perhaps being one. On-site legal services would then only be available to detainees on request. There must be concern that detainees, particularly the more vulnerable with poor English and little knowledge of the availability of legal services, will receive a worse service if this change is implemented. The board registers their concern at any possible reduction in the legal service offered. Diane Abbott expressed particular concern about detainees from from Sri Lanka and Zimbabwe, countries the UK has decided are not safe to deport people to. This has resulted in what appears to those detainees to be indefinite detention. This was a disappointing inspection of an establishment which seemed to have lost direction and purpose. The uncertainty about the centre’s future was undoubtedly a factor in this, making planning difficult and inhibiting necessary investment in the infrastructure. However, this appeared to have infected managers and staff with a short-term, reactive approach. It is important for the UK Border Agency to clarify the future of the centre as soon as possible. Not even Penny Lambert, who is supposed to be chair of the IMB, was prepared to admit something had gone wrong at management level. Instead what I found was a distinctly defensive attitude, and the rejection of what the prison inspector’s report had said. Whenever I raised a specific point from the inspector’s report I was greeted with excuses. I asked why the incidences of self-harm had risen and they said oh-yes we’re getting more distressed detainees. I asked why more than half the detainees said they didn’t feel safe in the centre and Colin Hodgkins (the long serving centre manager) said there were problems with the inspectorate’s methodology, in effect Mr Hodgkins said he didn’t accept the inspector’s report. It seams to me that our inspector of prisons has a deservedly very high reputation, and it seams to me their response to her report will be a box-ticking exercise because they do not accept and will not accept that there is something systematically wrong with the management of Oakington. As well as saying the centre would close within two years, and the exact date would be announced soon Home Office minister Phil Woolas committed to maintaining standards at the centre during the period prior to its closure. He explained the changes in the number of detainees feeling safe in the centre, and other changes noted in the inspector’s report as being due to a change in the type of detainees being held at the centre. He said it was now predominantly used to hold those whose applications have been refused, or there is a need to establish identity. He said people expecting imminent deportation would inevitably be feeling less secure. The only other person visible during the debate was Andrew Lansley, MP for South Cambridgeshire, in whose constituency Oakington is located. A full transcript of the debate, along with a video will be available shortly from Hansard / Theyworkforyou.com. I will link to this when it becomes available. This entry was tagged David Howarth, Immigration, Oakington, Parliament on June 8, 2009 by Richard Taylor. I applaud your work on this issue Richard. The conditions we subject asylum seekers too are unworthy of any nation calling itself ‘civilised’, yes ‘many people are concerned’. My particular interest is that the government are currently sending gay people back to regimes like Iran and deathzones like Iraq and telling them to ‘be discreet’. That’s our government’s policy. I wish that more were aware of what is going on ‘in our name’. That many have a civilised, human concern about asylum is why there will be a demonstration supported by a very wide range of organisations in London Saturday 20th June calling for an end to the enforced destitution of refused asylum seekers in the UK. Readers might also be interested in the version on the newly formatted beta version of Hansard (current). i was detained unfair en this centre in november 2007 for 2 days.i wrote to embassy united kindom en tel aviv,israel,never to respond.i ask why no.my true intention was only to ride in london,but the home office staff,to send me to oakington centre.i need one answer. Unrest at detention centre as man found dead – Cambridge News. I think the Cambridge public ought be better informed, by the Independent Monitoring Board about conditions at the centre.